As a WW II combat veteran of the 84th Infantry Division (Railsplitters), serving in the same unit as the subject of this book, I [Allan Wilford Howerton] was honored to be asked to read and react to the manuscript of He Wrote Her Everyday prior to its publication. Note from Blog host: the 84th Infantry Division landed on Omaha Beach, November 1 – 4, 1944, and fought in the Battle of the Bulge in December 1944 – January 1945. Ms Lindenberg, in getting the story together, has made a grand contribution to the literature of World War II. In addition to a war story, it is a wonderful book about love, longing, and faithfulness under unimaginable hardship and uncertainty. 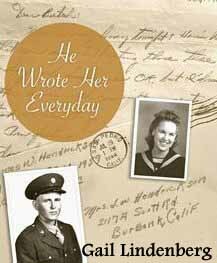 Anyone with an interest in World War II will like He Wrote Her Everyday. It tells, among many other things, a true story about the plight of replacements rushed to the front lines to augment units suffering heavy casualties in the Siegfried Line and the Battle of the Bulge. I was there, an infantryman in the same division, but thankfully not a replacement. They were assigned, often in the middle of a battle, knowing no one and without buddies to rely on. Many became casualties but those who survived adjusted pretty rapidly and went on, like the subject of this book, to make major contributions during the drive across Nazi Germany to end the war. Writing about war experience is difficult for those who experienced it first-hand. It is nearly impossible for someone who wasn’t there to give a believable picture of how things really were. Use of the letters written during the war gives this book a strong sense of the soldier’s walk through the snow. Lloyd Lofthouse, this blog’s host, is a former U.S. Marine and Vietnam Veteran. Posted on October 21, 2013 by Lloyd Lofthouse. This entry was posted in book promotion, book reviews, combat, heroes, military service, military veterans, war and tagged Allan Wilford Howerton, Battle of the Bulge, Gail Lindenberg author of He Wrote Her Everyday, Gail Lingenberg, He Wrote Her Everyday, He Wrote Her Everyday by Gail Lindenberg, true story of love during World War II, US 84th Infantry Division known as the Railsplitters. Bookmark the permalink.